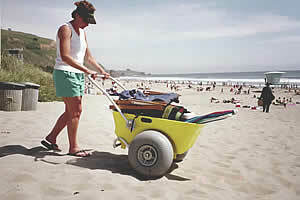 The Roleez cart is a sturdy little push-cart with balloon wheels to let you maneuver over any terrain with your coolers, picnic equipment, umbrellas, surf boards, etc. So whether it is sand, mud, or snow, or a soggy surface, you can bank on the Roleez cart to surmount all obstacles in finding that clean and shady spot on your camping trips or on the beach. I’d say this is primarily targeted at the family market where they have a lot of toys and accessories for their children. Young singles would never ever be seen pushing a cart down the beach, unless you are selling bananas, donuts and cold drinks.